In this ultra hot market any sign that things are slowing down is big news. While the market is still very favorable for sellers we are noticing that many homes in the tree section of Manhattan Beach seem to be sitting on the market for a little longer. The current average for “active” listings (those not sold or in escrow) is 56. The number can be a bit misleading due to the fact the local MLS days on market continue to accrue if a home that is in escrow posts as “backup” status. The number of days on market has risen every month since August of 2014 with a slightly higher number in January. As inventory slowly rises the days on market will likely follow. See all of the latest Manhattan Beach real estate market trends at our updated statistic pages. May marks the 5th straight month with an increase in available homes for sale in Manhattan Beach with 65 current MLS listings as of May 5th, 2014. See information below on the current market trends including current MLS listings, recent sales, pending home sales and home prices in this luxury coastal community in Southern California. We may be finally seeing some relief from record low inventory in the luxury market of Manhattan Beach CA. Other than the peak summer months of 2013 we have seen record and near record lows for active homes for sale. As of May 5th there are currently 65 properties for sale in this coastal community which is a dramatic improvement over the record low 25 homes for sale in December. Although we’ve now seen 4 straight months of increases in the available homes on the market, inventory is still nowhere near recent year highs which saw over 300 homes for sale in 2009. Due to the duration of this low inventory, pent up demand has driven prices to peak levels and in some premier locations well beyond peak prices prior to the bubble years. As most home buyers read about the market they have, inevitably heard that inventory is down and that it is a “seller’s market” which is certainly the case but both may be a drastic understatement at the moment. Inventory is at historic lows with both active homes for sale and sold homes being dramatically below the norm. 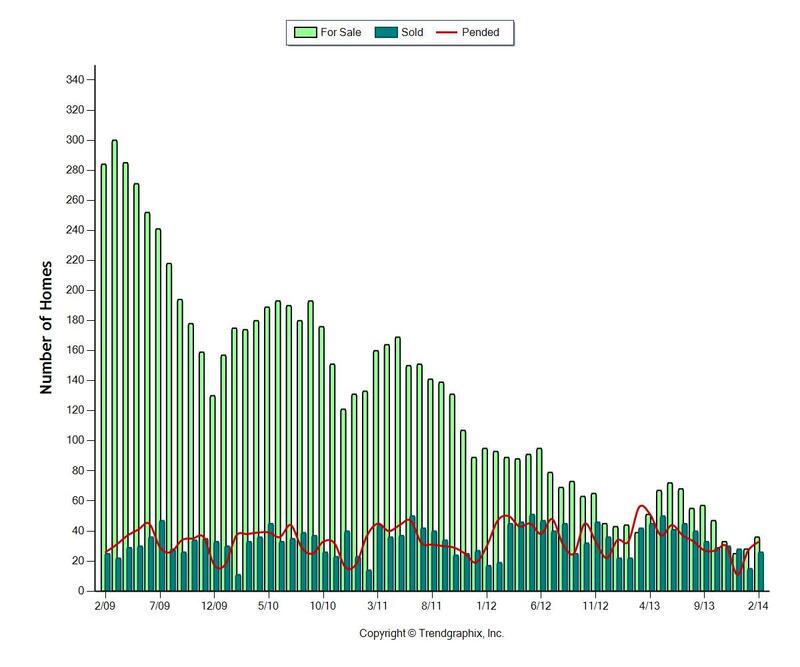 The chart below shows the past 5 years with monthly numbers indicating the number of homes active on the MLS (light green), the number of pending homes sales or homes in escrow (red line), and the number of homes sold or escrows closed (dark green) that month. The numbers are pretty staggering with February 2014 having only 26 closed sales and 36 current homes active on the market. Contrast that with February 2009 with only 25 closed escrows and 284 homes available for buyers and you’ll understand why buyers are willing to do just about anything and pay any price to get a home in this luxury coastal community. Due to low interest rates, and Manhattan Beach schools surpassing even their own record test scores, the demand for homes is as strong as ever. Just Like This Crazy Weather….The Manhattan Beach Real Estate Market is Hot! The only thing hotter than the 80 degree days we’ve seen so often in January is the real estate market along the coast. The market seemed to slow just a bit and appeared to finally be calming down, but recent listings and sales indicate that we’re quickly back in frenzy mode. Of my last two sales, both buyers were willing and happy to pay a premium if it meant the difference in getting an accepted offer. Many recent home sales have been at, or over list price, even with the inflated list prices and as another realtor recently said “price was not an issue for her buyer” which makes for a challenging market for buyers trying to stay within a budget. The information below is a brief overview of real estate in Manhattan Beach in the past 30 days. The key information is to not that there are far more homes in escrow then active on the MLS with an almost equal number of closed sales to current listings. I recently had two listings quickly go into escrow but confused a few agents with the homes status and showing instructions. Both homes were put into “Pending” instead of “Backup” status but both showed agent notes indicating we were looking for backup offers and that the homes could still be shown. Why you might ask? (same question several agents had). The reason is that the CRMLS days on market continue to accrue in backup status and not pending status which leads, in my opinion, to very misleading information and data. As an example I just sent information on a sold home to a client to use for refi comp purposes. It showed 51 days on market, which is a very good indication that it may have been priced too high and took a while to sell (in this current sellers market). Upon a deeper look the home sold after 7 days and the rest of the time was in escrow. A home selling in 7 days paints a very different picture of current market conditions. If home buyers see an average days on market of 45-60 but the reality is that homes are going into escrow generally within the first 10 days, homebuyers will not have the accurate information they need to make informed decisions. It impacts listing agents as well as many potential sellers want to know how quickly we, as the listing agent, sell homes and what the days on market is. They do not want to see that we sold something after 51 days on market and this lack of correct information may eventually cost us a listing in the end. Days on market is a critical tool in terms of market and agent perception and, in my opinion, only represent the days that a home is in “active” status.